I'm reading these services in terms of their urban interfaces, their material qualities and the interest in the 1870s-1890s of physical networks across cities. 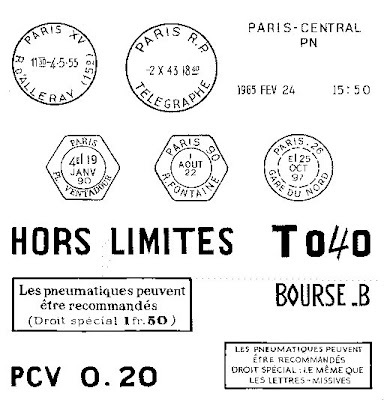 Paris is interesting because of an explosion of postal and telegraph products and services, the response to the siege of the city (Balloon Post! ), and the shift from electric to material form to someone's doorstep in terms of message delivery. The Hôtel des Postes fascinates because of its ingenious interfaces within the building and its processing capability; the pneumatic tubes are fascinating because they make manifest the force of air and use it to literally propel information across a building or a city. Between the double pressures of development and industry, this much feral openspace on the waterfront is an anomaly, even for the spottily derelict Middle Branch. It is heavily vegetated, but walking the site, feeling the mossy bricks, ceramic powerline insulators and huge concrete blocks underfoot, one sees that this is really just a big pile, a ground made of stuff. The plants, in some cases huge trees and dense woods, are only the most recent (now the second most recent) system to infiltrate, overlay, and, however incompletely, organize this space. It is interesting to note how these two posts help us defamiliarize our own understanding of cities. Whereas Molly's urban/communications archaeologies ask us to revisit the unrelenting physicality and organizational potential of communications networks and buildings in th 19th century France, Fred's approach is more akin to William Cronon's ecological studies of New England and Chicago. In short, both make for some very compelling reading.